In the mid of September 2017, the PMBOK Guide 6th edition was released by PMI. The Guide has been revised considering the latest trends and practices in the Project Management. Not only this, but we can witness the inclusion of Agile in all processes of the PMBOK Guide and these changes will definitely impact on PMI’s certification exams. We all were waiting for the confirmation from the PMI on the change in PMP exam and here we have a date March 26th, 2018. PMI also confirmed that the experts from all around the world are working on setting questions to ensure the PMP certification remains relevant with current practice. 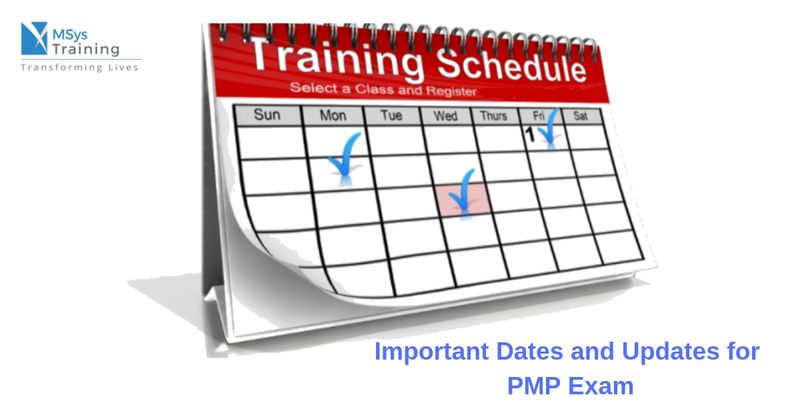 However, PMP is not an exam based on the PMBOK Guide, but it is considered as a primary reference for the exam. Hence, the updates in PMBOK Guide will have some major impact like changes in terminology and harmonization of process groups, tools, and techniques. Addition of a new chapter on the role of the project manager that focuses on leading projects effectively. As the exam is changing in March, 2018, PMP aspirants who are looking to get certified and take their career to new heights, now they have time to prepare and pass the exam before the exam changes according to PMBOK Guide V6. MSys organizes 4 days PMP bootcamp every month with a 100% pass guarantee. You can enroll and get certified before March 26th, 2018.